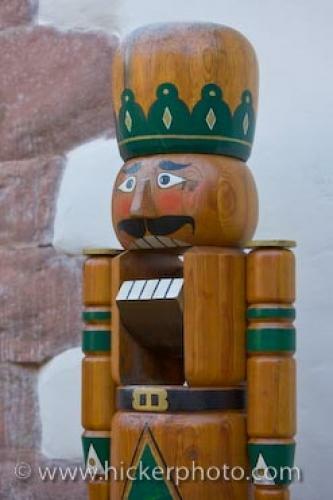 A beautiful handmade nutcracker on display at the Christmas markets in the historic village of Michelstadt in Hessen, Germany. markets in Michelstadt in Hessen, Germany. ... The original carvings of the nutcracker were developed as a small cottage industry in the forested countryside of Germany. This is why when you visit the Christmas markets in Michelstadt and other areas of Germany, many beautiful nutcrackers that are hand carved are always for sale. A hobby that never seems to fade for the people of Germany.Wooden nutcracker at the Christmas Markets in the historic village of Michelstadt, Hessen, Germany, Europe. I photographed this photo with the digital SLR camera model Canon EOS-1Ds Mark III, aperture of f/3.5, exposure time of 1/100 sec. on ISO 100, as always I used a original Canon Lens, the focus lenght for this picture was 78mm.